This is a simple undertaking with beautiful results. I’ve done this wearable art project with my Artshop students and they loved it (For those new to the blog, I work with an art program for adults with special needs, and my students are the coolest). 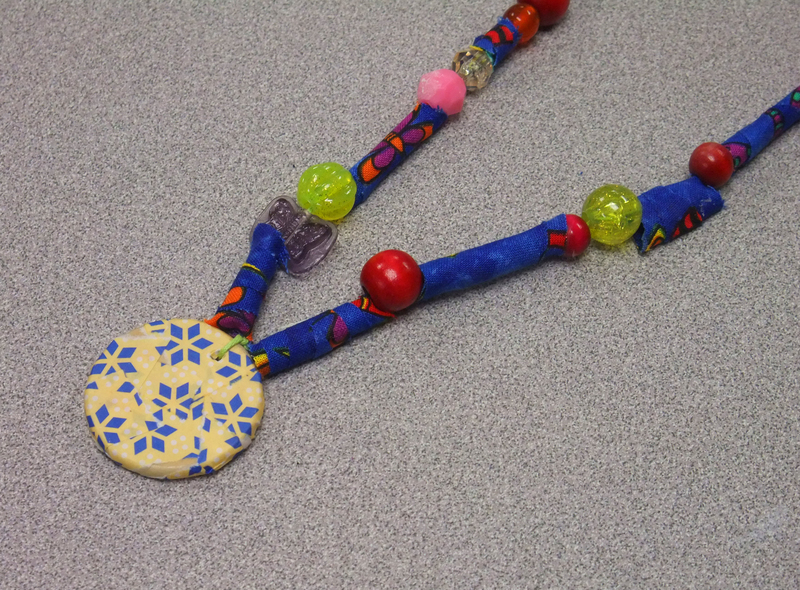 A student’s decoupaged pendant necklace (accented by fabric beads she rolled herself, too!) We share a love of all things rainbow. Any jewelry created with these handmade beads and pendants has an artsy, unique look that draws constant oohs, ahhs, and inquiries. What’s also great is you can completely customize the style based solely upon the paper you choose. 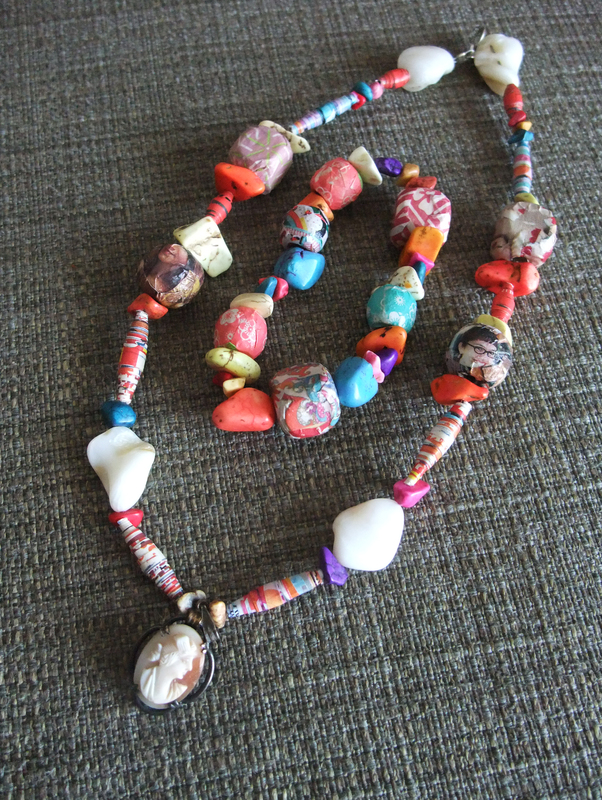 You can use magazine pages (see faces on my cameo necklace) but for most beads I prefer using lightweight origami paper. This thinner paper bends and forms to the shape of the bead much easier, and once the sealer dries the wrinkles lay much flatter. Besides the paper, you will also need wooden beads (These can be bought in almost any craft section or hobby store in a bulk mixed container), mod podge for paper or any other decoupage sealer in any sheen, a large-ish cheap paint brush, wooden discs in the desired size (found amongst the other unfinished wood pieces like plaques, boxes, letters, etc. in most craft or hobby stores), and a small crafting drill (or any drill that offers smaller bit sizes) to drill a hole in your pendant. If you don’t own a drill or just don’t want to bother, you can buy pendant backs to glue on at the end. 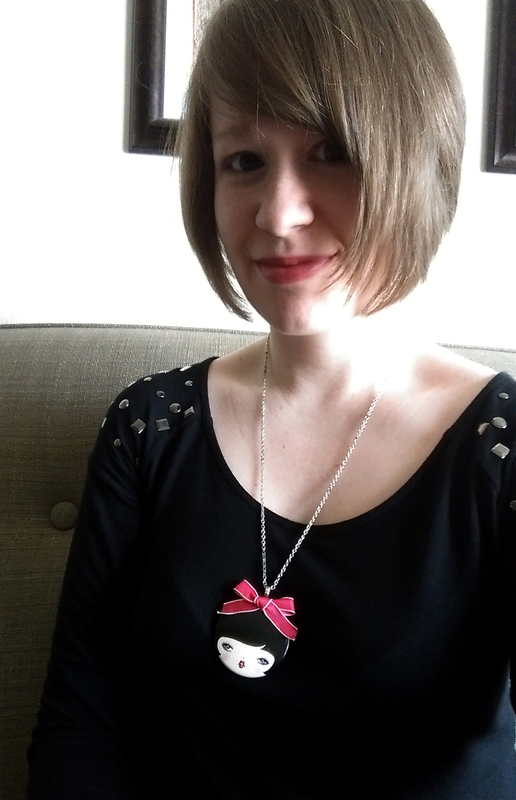 I don’t live in an area with a large array of art and jewelry supply stores, so I ordered mine online – they’re cheap. The process is the same for both the pendants and beads. Once you choose your paper or combination of different papers (mixing and matching can look cool for the pendants, but the beads are so small I recommend sticking to one design only. ), tear them into pieces between 1 and 3 cm in size. You can paint the sealer on the back of the paper at this point, or just dip the paper in the goo and then smooth it onto the surface of the bead/pendant with your fingers to make sure all wrinkles are flattened down, and there are no air bubbles. The more soaked the paper is, the more malleable it will become, allowing you to form it flat to the surface. Your fingers WILL get messy. It’s ok, just roll with it. A bowl of water nearby to rinse off every so often will stop them from getting too sticky as you work. With both the beads and pendants, don’t worry about the hole. Once the entire surface is covered with paper you can use a toothpick to poke the hole back through before it dries. Set the beads and pendants on wax paper to dry so they won’t stick. 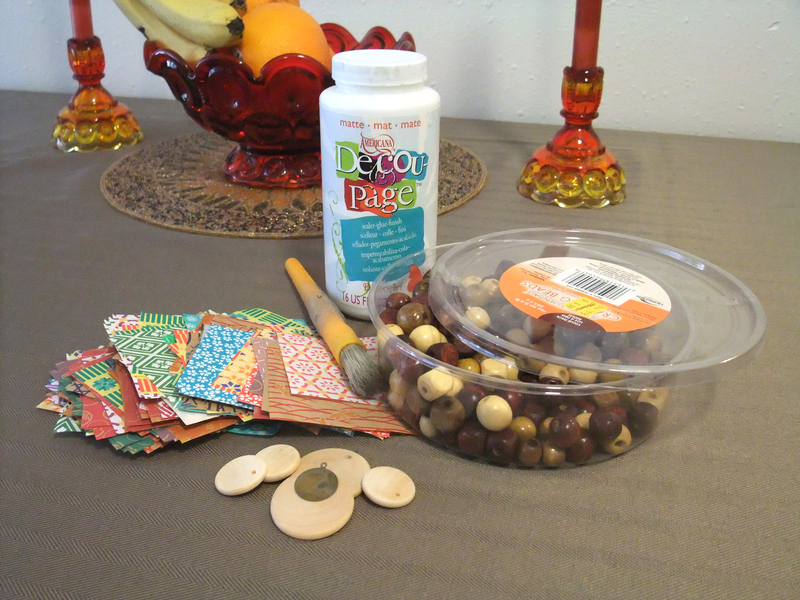 Once they are dry, coat them 1-2 more times with mod podge using the paint brush. Once again, mod podge or any thick sealer is really hard on brushes so I recommend a cheap brush. Voila! Making these beads can be surprisingly therapeutic after a long day. Turn on the television or your favorite music and get cracking! Look! She even has a hair bow. What could be better? Part 2 : Since I enjoy sharing other creators I am in love with, I wanted to show another option of what to do with those blank, unimposing little wooden discs. This artist I discovered on etsy turns these wooden circles into a unique cast of adorable characters with a little acrylic paint, gloss sealer, and mad detailing skills. Her shop even has some recognizable femmes like Katniss and Cinderella, but I like her original characters best myself. I hope some of you try this out when you have a day off. Who knows, you may even come up with some of your own unique tricks for turning these wooden blank canvases into awesome wearable art!